The tsunami warning for British Columbia has been lifted, according to the West Coast and Alaska Tsunami Warning Center in Alaska. The Provincial Emergency Program's advisory is still listed on its website, but automated calls received by CBC News confirmed that the advisory was no longer in place. 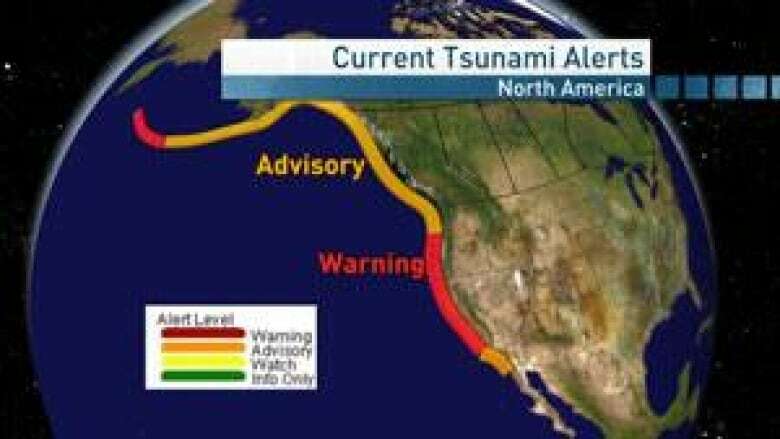 The Alaskan centre cancelled the advisory for B.C., Washington and northern Oregon at 6:49 p.m. PT after the coast was no longer threatened by the tsunami that devastated Japan and caused millions of dollars of damage in California. The first effects of the Japan tsunami reached Canada's West Coast about 7:30 a.m. Friday, and wave-height changes were negligible. Kelli Kryzanowski of Emergency Management B.C. in Victoria told CBC News that the tide gauge on Langara Island at the northern tip of Haida Gwaii had registered no change. "When the wave was expected to come through, it did not record any sea level fluctuations." Carol Kulesha, the mayor of the village of Queen Charlotte, officially called off the state of alert for that island’s residents, but warned boaters to remain vigilant. 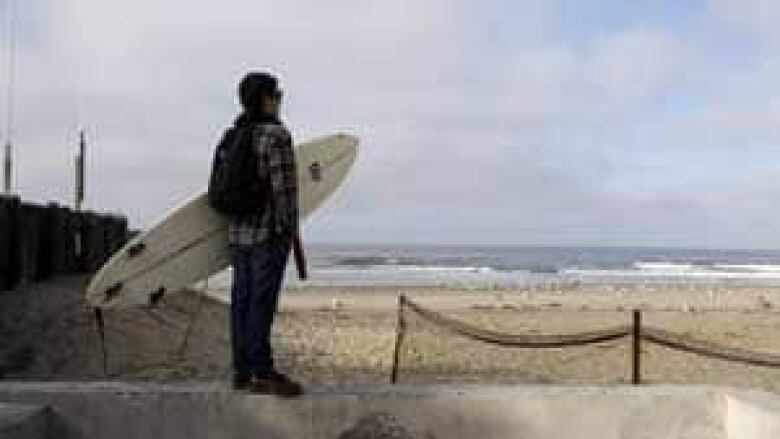 "You should be aware that strong currents and waves can occur and they can occur for a long period of time afterwards," Kulesha said. After the earthquake, tsunami advisories were issued for coastal areas in northern and central B.C. and for the west coast of Vancouver Island from Cape Scott to Port Renfrew. Advisories are not as severe as a warning, but the Provincial Emergency Co-ordination Centre advised local governments in coastal areas to activate emergency plans. "They aren't expecting to see any massive inundation, but we are looking at some potential waves about 50 centimetres or so," Kryzanowski said earlier. Still, anyone thinking of going to the water's edge was cautioned. "People that are on the beaches could get knocked off their feet. This comes in as you can see with an incredible amount of force, so we do want people off the beaches as well as boats in harbours and marinas [that might] suffer some damage." The potentially affected areas included B.C. 's north coast, Haida Gwaii, Bella Bella and the outer west coast of Vancouver Island, including Cape Scott running to Port Renfrew. "The east coast of Vancouver Island is not at threat, and neither is Victoria or Vancouver," Kryzanowski said. "In British Columbia, we have what is called the provincial emergency notification system," Kryzanowski said. "We send out a thousand phone calls to local authorities, stakeholders such as RCMP, fire and utilities, as well as to the media. Then the local authorities activate their local emergency plans, open up the emergency operation centres, and begin to notify those in their jurisdiction who require to be evacuated." IN DEPTH: Why no tsunami after New Zealand quake?